ClockworkMod also known as CWM is one of the most popular custom recoveries for all android devices. Custom recoveries in general helps you perform some more advanced functions such as full backup of your rom which is also known as nandroid backup and also restore, it also helps you install both signed and unsigned zip updates, themes, kernels etc. Though all android devices comes with stock recovery but they only perform some few operations like installation of official zip update, factory reset etc. That’s the importance of custom recovery. It over writes the stock recovery and also help you perform some additional functions which you can’t find in the stock recovery. There are different ways of booting into recovery. You can either boot from startup by pressing together the volume down and power button or volume up and power button, depending on the device. You can also boot into recovery with rom manager or mobile uncle for mtk devices. 2. Install zip from sdcard. Today I will be giving you a detailed explanation on each of the menus and their submenus. 1. Reboot system now: This is the first option you find and what it does is to reboot your device into normal mode. ==> Choose zip from sdcard: This option lets you install any CWM flashable zip file from your sdcard. This zip file can either be a rom, themes, application etc. ==> Apply /sdcard/update.zip: this option automatically installs any flashable update.zip file saved inside the root directory of your sdcard. All you just have to do is to name the zip file update.zip. ==> Toggle signature verification: This option lets you enable or disable signature verification when installing roms. Though it’s advisable to disable signature verification when installing custom roms as most custom roms are not signed. ==> Toggle script asserts: this option is used to enable or disable script asserts. Script asserts is just a way of knowing if the rom you are trying to flash is compatible with your device or not. ==> Choose zip from internal sdcard: This option allows you to choose any flashable zip file from any directory in your internal sdcard. Though this option is not available on all devices. ==> +++++go back+++++: this option will return you to CWM main menu. 3. Wipe data/factory reset: this option is used to wipe all your data and users installed application. Note that this will not affect your sdcard. And also if your internal sdcard shares a different partition with your app storage then whatever you save in your internal storage will also not be deleted. But in a situation where your applications and internal sdcard shares the same partition then everything will be deleted. This option is also very important when flashing a new rom which defers from the one you are using before. As it will help delete all leftovers from your previous rom. 4. Wipe cache partition: this option is used to wipe your cache partition. Cache are files saved by app and also your OS to enable a quick access. This helps to save time and also sometimes saves data. It’s always advisable to wipe cache partition before installing a new rom to prevent bootloop. ==> Backup: this will make a complete backup of your android device. And the backup can be found inside sdcard/clockworkmod/backup. ==>Backup to internal storage: this will create a backup inside the internal sdcard instead of the external sdcard. And this option is not available on all devices. ==>Restore from internal sdcard: this will simply restore your backup from the internal sdcard. ==>Advance restore from internal sdcard: just like the advanced restore from this will give you the option of restoring a particular part of your backup from internal sdcard. 6. Mounts and storage: This option deals with the mounting, unmounting and also the formatting of selected partition. ==>Mount / data or unmounts/data: this allows you to mount or unmounts your data partition to be formatted the data partition contains all your installed apps and apps data. It also contains your personal data like contacts, call logs, sms, settings etc. ==>Mount /system or unmounts /system: this lets you mount or unmount your system partition for formatting. The system partition contains all your rom. ==>Mount /cache or unmounts /cache: this contains temporary files saved by both your os and also some application to allow them load up faster. This option lets you mount or unmount them for formatting. ==>Mount /emmc: this option is used to mount or unmounts your external storage for formatting. This options is not available on all devices. ==>Mount /sdcard: this serves as your internal sdcard. This option allows you to mount it for formatting. ==>Mount /sdcard-ext. : this lets you mount your sd-ext. the sdcard-ext contains all apps saved on your external sdcard. ==>Format /data: this option wipes all your datas which consists of all your apps/ app datas, contacts, sms, call logs e.tc. ==>Format /system: this formats the system partition of your device. Note that this option should be used with care as it gonna format all your rom and leave your device empty. ==>Format /cache: this option wipes your cache partition. ==>Emmc: this option formats your external sdcard. ==>Format sdcard: this option will completely wipe your internal sdcard. ==>Format /sd-ext: this option will completely delete all apps saved on your sdcard. 7. Advanced: this contains all advance and miscellaneous options. 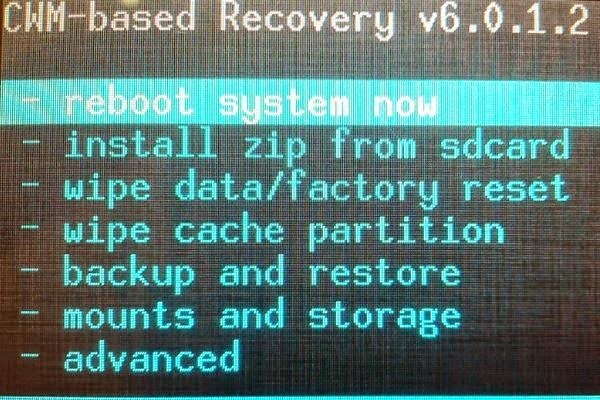 ==>Reboot recovery: this will restart the cwm recovery. ==>Wipe dalvik cache: this will wipe your dalvik cache partition. It is advisable to always do this when flashing a new rom. ==>Wipe battery stats: this basically wipes battterystats.bin which is located inside /data/system/. Though many people believe that wiping the battery stats increases the battery life but this is very wrong has it has no effect on your battery life. ==>Report error: this is used to report any error to the cwm developers’ team. ==>Key test: this just basically allows you to test the hardware keys of your device. ==>Show log: this just shows the log of all activities performed on your recovery. ==>Partition sdcard: this is used to partition your internal sdcard to increase space. It’s advisable to backup your data before doing this as your sdcard will be formatted. ==>Fix permission: this option helps to fix some apps permission errors and it helps with fixing force closing of some apps. So I believe with this no menu on cwm should look strange to you anymore.. But incase you still have problem, just leave your question in the comment box.